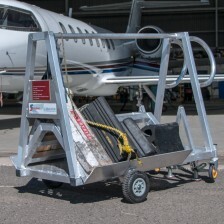 Originally designed and built by SafeSmart Aviation as part of a suite of products that help technicians work at height around a client’s Airbus A350 aircraft, this stair system protrudes right into the engine nacelle to allow access to blades and surrounding componentry. Technicians do not have to overreach like they would have to on a standard ladder when servicing or inspecting engine fans. 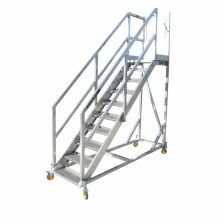 These stairs can be used at the front of rear of the engine and can be easily moved around by hand.